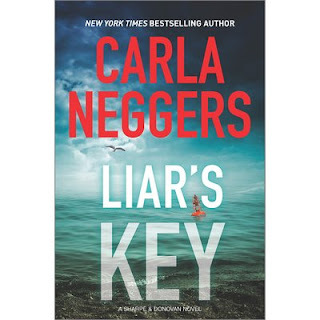 I look forward all year to each new mystery from Carla Neggers -- and sometimes there are even two of them, as she's currently writing two series at a time. Art sleuth Emma Sharpe and her fellow FBI investigator (and fiancé) Colin Donovan are my favorites. I'm also a fan of their family members and friends, whom Neggers weaves in and out of the series, sometimes focused on one, sometimes on another, and usually combining scenes in both Ireland and Maine, where the warm welcomes of small inns and dinner spots provides a charming contrast to the rocks, fogs, rutted back roads, and sometimes boats and excursions into, say, Dublin or London. LIAR'S KEY is a delight -- a traditional mystery with reliably smart sleuths and just enough danger to season the development of Emma and Colin's sturdy romance. Actually as the book opens, their wedding is mere weeks away, and Colin's struggling to decompress from his most recent undercover work while also setting up a honeymoon location. But it's Emma whose skills must cut forward first, when former FBI legend Gordy Wheelock turns up on her turf. Gordy's supposed to be retired, making a civilian life with his wife in the South. But when he lands in Emma's Boston office, he's sniffing for details of a presumed art crime, a heist of a mosaic. The part that has him back on the trail of a crime -- when he shouldn't be! -- is that he caught word of the theft during a London party that involved way too many memorable people: Emma's parents, for instance, and her wily grandfather, as well as the sophisticated and probably criminally minded Oliver York. Plus an agent from Britain's MI5, complicating the gathering to a level of suspense and intensity that Gordy just can't resist. Gordy started past her but stopped abruptly. "I hoped you'd level with me, Emma." "That's a two-way street, Gordy." "I always believed there were no secrets between us. I should have known better. You're a Sharpe, after all." "Sorry the fishing expedition didn't work out for you." He laughed. "I had that coming. You're tougher than you used to be." Emma needs to be tough, for the perils of her job on the HIT (High-Impact Target) team of the FBI, "focusing on criminals with virtually unlimited resources." Readers of the series will recall her risky efforts in Ireland to nail the brilliant Oliver York for art theft ... and will enjoy York's abrupt reentry into her casework. But this isn't the moment she wants to be on the job, with her wedding so close and the need to create a safe harbor in Maine for Colin's return. As in the earlier books in the Sharpe & Donovan series, there are budding romances here, blossoming around the passion and joy that the engaged couple share with their community of sleuths and family members. Count on some intriguing scenes with Father Fin Bracken, too. Most importantly, the challenge of figuring out whether there's actually been a mosaic theft, and why it might affect Emma's hometown, is central to the investigating that Emma pursues. The twists are clever, the pace relentless, and the clock's ticking toward the wedding -- if all the wedding party can arrive at that point, alive, healthy, and ready. Why the title, LIAR'S KEY? Neggers doesn't reveal that until nearly the end of the mystery -- but from the start there is at least one consistent liar on scene, and several who doggedly mislead. Emma Sharpe's task is to figure out the danger -- before it can spoil her big celebration ahead. The book's now on sale (August 30 release date); although Neggers has few events scheduled for signings (see http://www.carlaneggers.com), she's highly accessible through the website, where other 2016 releases are also described. Let me know if you, too, get hooked on her neat plots, warm and sensible sleuths, and gorgeous backdrops. Good storytelling, from MIRA Books.